Bike share is currently available in DTLA for monthly and annual pass holders. Walk-ups begin on Aug. 1. All the info you need on our bike share is here. If you take a bike out for a spin, tweet us a pic please! Really anxious for the @metrolosangeles ballot measure this fall. Service issues not their fault, but not good for voters. That’s not one of our trains. Dogs in carriers please. As for above, I’m not sure who is braver — the dog or the dude. Still, this region has never tried anything quite this ambitious. And while drivers here have long revered their cars, for every Jan-and-Dean moment of rolling up the Pacific Coast Highway, sun glistening off the waves, there is the punishing attempt to cross town on Wilshire Boulevard at rush hour. There is reason to think that what once might have seemed implausible could happen. There’s some varying viewpoints on service from riders. I think the gist of it is toward the end when my boss, CEO Phil Washington, predicts there is a cultural shift underway with western cities embracing transit. See item below about the number of Pacific Rim cities/regions that will vote on transit-related items this fall. In this op-ed, Juan Matute — the associate director of transportation studies at UCLA — writes that the Orange Line is a very cost effective way to move people and that it would make sense to improve it before turning into a rail line. The most urgent improvement is to speed up travel time by reducing waits at signalized intersections. The Orange Line covers 18 miles in about 56 minutes at an average speed on par with the Expo Line light rail. Calls to speed up the Expo line by reducing waits at signalized intersections shouldn’t be exclusive to rail. Granting Orange Line buses priority at traffic signals allows Metro to increase the frequency of service, relieve crowding and increase the volume of passengers that can be served daily. The barriers to transit signal priority are now entirely political, as the state has eliminated environmental review procedures that ignored transit passengers. Our politicians simply have to decide to shave travel times for thousands of daily mass transit passengers by adding some wait time to vehicles at crossings. Metro’s sales tax increase ballot measure would supply $286 million in funding for Orange Line grade separations to be completed with a target date of 2025-27 and would help fund a conversion to light rail with a target date of 2057-59. More about the ballot measure here. A study commissioned by Metro was released last December and showed that the Orange Line could probably shave a few minutes off its cross-Valley travel time by safely increasing speeds across some intersections. Some testing was done earlier this year and continues. As far as traffic signal priority goes, that will require some work by both Metro and the city of Los Angeles. The owner of the Japanese Village pedestrian mall wants to stop construction, alleging that Metro needs to secure rights for a portion of tunnel that runs under the mall. Metro officials declined comment, not having yet seen the suit. Generally speaking and not speaking to the specifics of this suit, stopping an ongoing construction project is difficult. A lawsuit challenging the environmental studies of the first phase of the Expo Line sought to stop construction, but the courts declined to do so. 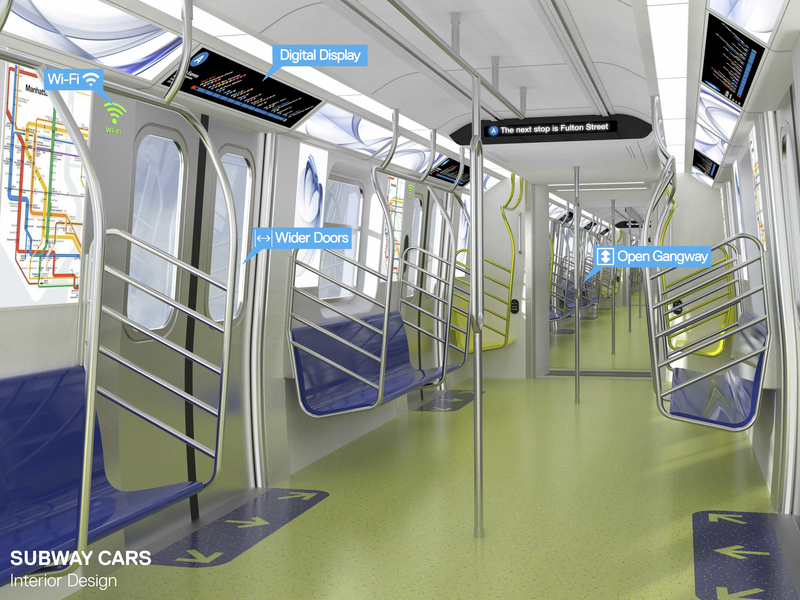 Up to 750 of the cars will be ‘open-end’ design that has become big in several other world subway systems. The open-end cars allow people to more easily move from car to car. 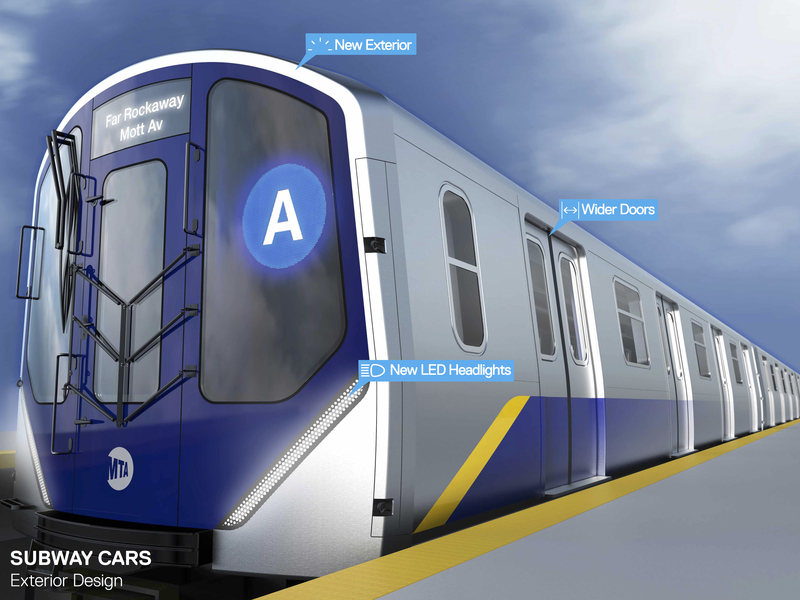 The new cars will also have wider doors. The New York Subway has experienced record ridership in recent times, along with big-time crowding. As some of you likely know, Metro is in the early stages of acquiring new subway cars for the Red/Purple Line — we need to eventually replace existing vehicles and, of course, have new rail cars for the extension of the Purple Line to Westwood. The garage was built by Metro, the city of Azusa and Foothill Transit. Metro had 200 spaces originally and is now leasing an extra 145 spaces that belong to the city of Azusa. 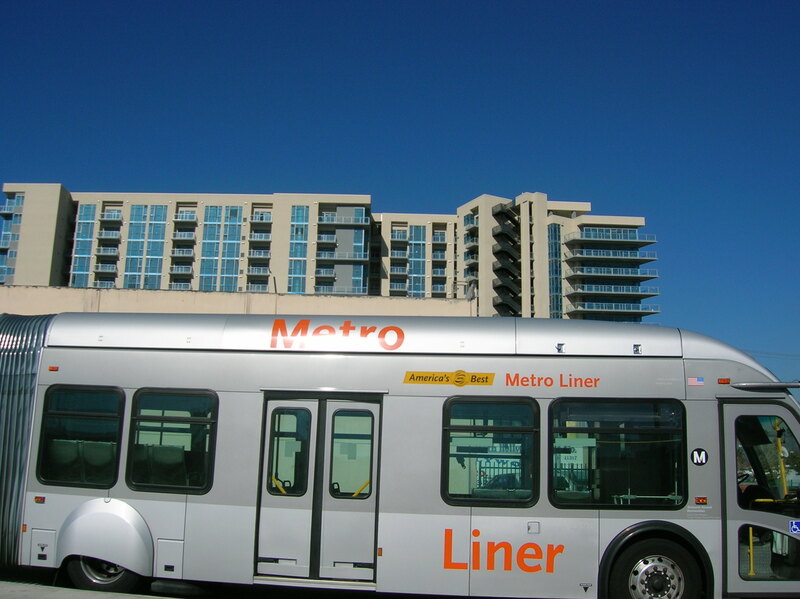 All the new spaces will be part of Metro’s paid parking program — for $39 riders can lease spaces that remain open to only permit holders from 4 a.m. to 10 a.m.
Metro and the city of Azusa are also looking at finding other parking nearby. 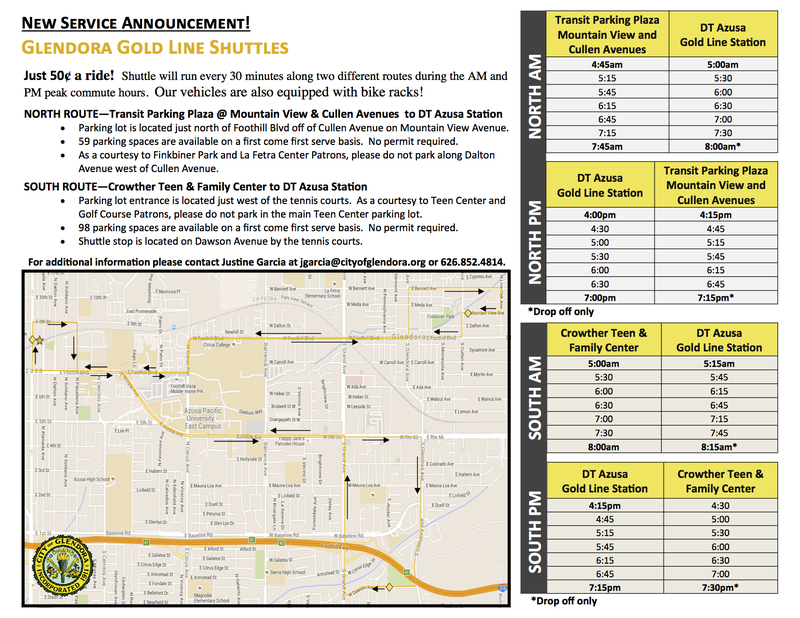 As the article notes, the city of Glendora is also running a shuttle bus to the station. As we’ve discussed previously, voters in many of the large Pacific Rim regions (San Diego, San Francisco, Seattle, L.A.) in the U.S. will be considering sales tax increases or bond measures to fund transportation on Nov. 8. The Greater Seattle region will consider a sales tax measure that would fund a big expansion of light rail — and spend a lot of money on thousands of spaces of light rail parking. Some like it. And some don’t. In my opinion, the person from UCLA Transportation Studies, who thinks it’s better to keep the Orange Line as a Bus Rapid Transit system rather than upgrade it to a Light Rail system, should be taken with a grain of salt. I recall that UCLA Transportation Studies has been anti-rail transit and pro-highway transit since at least the 1970s. Its logo is derived from the international symbol for freeways and autobahns. It may very well be that the Orange Line, at this point, should remain BRT. I am for all forms of public transit, except the “Hyperloopy.” However, it does not take a university professor to know that eventually the Orange Line will need to be made a rail system if it’s to keep up with future demand. Yes, the Orange Line has been packed from day 1, and the demand is only likely to increase. I’d like to see it extended from NoHo to Burbank Airport, Sun Valley, Pacoima – to meet up with itself in the upper SFV, like the London Underground’s Circle Line. Let there be Light Rail! Unfortunately the Gold Line shuttle doesn’t take TAP, and the TAP people don’t have any intent of expanding their service to the couple dozen or so local return operators that receive Metro funding but are still not on TAP, especially the services in the San Gabriel Valley. Who has quarters in their pocket anymore? Thanks for the heads up on the NYC subway cars procurement. I’m especially happy to hear about the open gangway design. About a year ago, Yonah Freemark, in his Transport Politic blog, wrote about open gangways and pointed out a number of advantages to them. Surprisingly one disadvantage was not mentioned, namely the challenge of removing one out-of-service car. Enough spare cabcars must be kept in reserve for the eventual failed or damaged one, and removing one of the ‘middle’ cars may not be quick or easy. This is one reason why unit consists like Talgo are not more popular. At any rate I’d like to know more about the design of these new open gangway vehicles. BTW they could come in handy for increasing capacity if station platforms permit. Reportedly the platforms at the west end of the Green Line are only long enough for two cars. A longer open gangway consist would allow cars at either end to not be adjacent to the platform; of course new ‘door opening’ safety logic would have to be implemented. Per http://www.nycsubway.org/wiki/New_Technology_Trains_-_B_Division , many of the present-day New York subway cars are in 4 and 5-car semi-permanently coupled sets using draw-bars, with cab cars at both ends of each set. They can then can be coupled into the 8 and 10-car consists that are common in New York. LA Metro should be so lucky that 8 and 10-car trains are insufficient to handle the traffic load. When the IRT was originally built in 1904, the local platforms were only 4 cars long and the express platforms were only 6 cars long. It wasn’t long before all platforms were lengthened to accommodate 10-car trains. This why I feel the Metro is short-sided with 3-car LRT platforms. Most of us remember the Blue Line fiasco where the original platforms were only 2 cars long and all soon had to be extended to accommodate 3-car trains. I am not aware of any New York operational problems due to out-of-service cars. I suspect that if one car is inoperable, the other 7 or 9 cars are sufficient to hold to the schedule as all cars, cab or not, have the same 4 motors.. In the 1940s, I know from personal experience that one could walk between subway cars. It was fascinating to watch cars in front of yours one-by-one peel off and then straighten out when rounding curves, as you could see the entire length of the train through the open train doors. Same with Metro North and Long Island commuter 8, 10, and even 12-car trains. In many cases the trains are too long for the station platform and thus the passengers are told which car to be in so that they can disembark. I’ve been on a number of MTA cars that have the new digital maps. Very helpful in terms of determining where you are, and how soon you’ll be getting off, particularly on long lines with lots of stops. I agree with Juan Matute — the associate director of transportation studies at UCLA — improve the Orange Line by giving priority at street crossing. I think the SFV would benefit more with the North/South rail line on Van Nuys Blvd from Sylmar to the Orange Line/Red Line station in North Hollywood.